City of Lethbridge on Highway 5 in Southern Alberta Canada. South on Mayor Magrath Drive (becomes Highway 5 at the city limits) to the town of Magrath (31 kms/19.2 miles). Turn left (south) into the town and travel 1.4 kms (0.8 miles) through town to 1 Avenue S.
Turn right (west) and continue for 1 block to 2 Street W.
Turn left (south) and continue south. The road will curve west and become 5 Avenue S. Our park will be on your left. Head north on Highway 5 toward Lethbridge. When you get to the town of Magrath, turn right (south) and travel 1.4 kms (0.8 miles) to 1 Avenue S.
Head north on Highway 4 to highway 52. Turn left (west) on highway 52 and travel approximately 24 kms (14.8 miles) through Raymond to Highway 5. 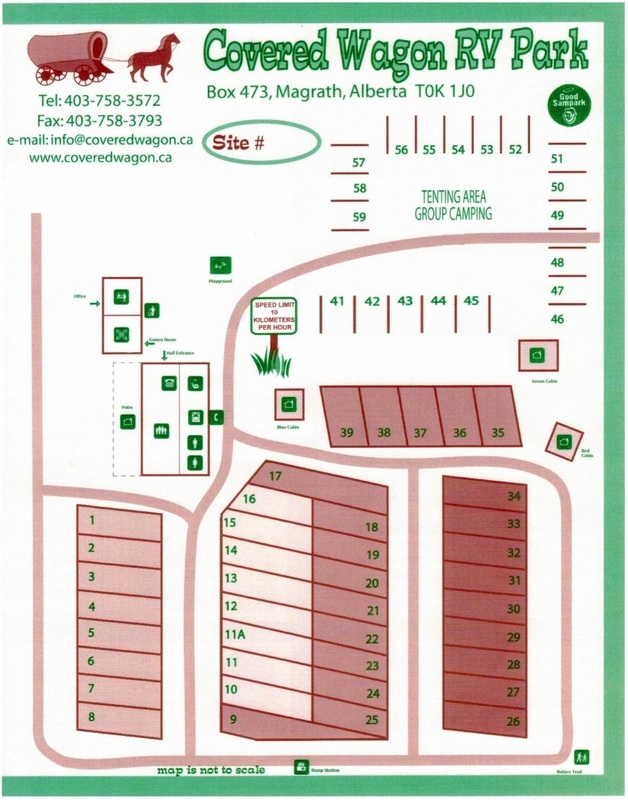 Turn left (south) and travel approximately 7 kms (4.3 miles) to the town of Magrath. When you get to the town of Magrath, turn left (south) and travel 1.4 kms (0.8 miles) to 1 Avenue S.
Turn left (south) and continue south. The road will curve (west) and become 5 Avenue S. Our park will be on your left.